Black Cherry Berry Iced Tea with Mint and Lime. NOM NOM NOM. | Name-Brand Ketchup. Black Cherry Berry Iced Tea with Mint and Lime. NOM NOM NOM. The Sioux City Beverage Company in Iowa used to make a soft drink called “Kentucky Nip Sparkling Cherry Julep.” This stuff was fantastic. Cherry, berry, mint, and a hint of lime. It was never easy to find north of Iowa, and anyway the company got gulped down by a bigger conglomerate. It’s now been rebranded as “Sioux City Cherries’n’Mint.” Doesn’t quite have the same pizazz as “Kentucky Nip,” nor the image of the dignified Kentucky Colonel enjoying his afternoon refreshment. The Celestial Seasonings company makes a caffeine-free herbal tea called “Black Cherry Berry.” Blackberry leaves, sweet cherries, black cherry flavor, hibiscus, rosehips, chicory, hawthorn berries, and chamomile. Sounds healthy. 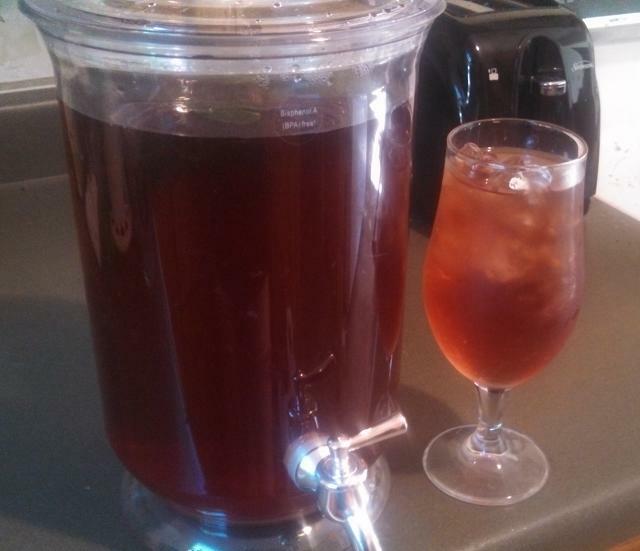 So I made two gallons of the Black Cherry Berry tea using the environmentally-friendly “sun tea” procedure. (It is not for me I speak, but for our Mother Earth.) I muddled up about a dozen fresh mint leaves using a mortar and pestle, added those to the tea. Finally I tossed in a couple of packets of True Lime. And here it is. Holy cow, is this stuff good. 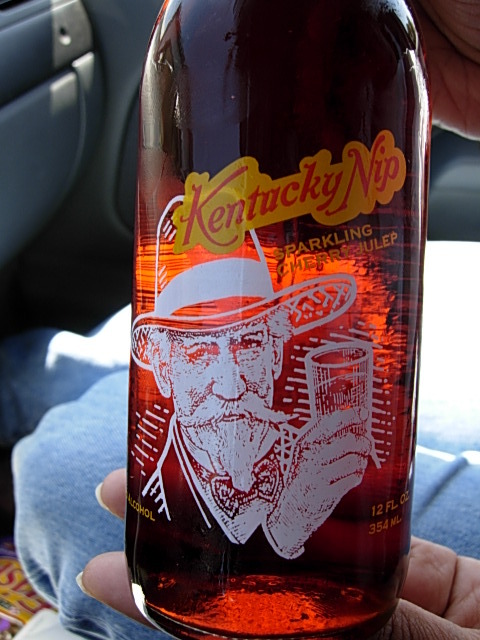 Even without sugar it tastes just about exactly like “Kentucky Nip.” Not carbonated, true, but that’s not such a bad thing either.